Prescient has a five-phased approach or methodology that our intranet consultants use to creating highly effective intranets. The first two phases are Assessment and Planning. Prescient understands the importance of strategy, planning and measured success. Our five phase approach enables us to offer tailored services to each client and develop successful strategies, create effective plans and deliver measured success in every project. Despite the traditional focus on technology and integration, the most critical phases are the initial ones: Assessment and Planning. At the heart of an intranet's success is the strength of the plan that governs it. Before undertaking any intranet plan or build, an extensive needs or business requirements assessment is necessary to identify, develop, prioritize, and document goals and current practices. It is recommended that any organization consider engaging a third-party or consultant to conduct the assessment. While the cost may be prohibitive for organizations with tight budgets, a third-party may be more successful in gathering sensitive opinions and feedback as a third-party, unlike stakeholders, have no personal attachment or stake in the intranet and do not have any political agendas. It is important to gather the needs and requirements of stakeholder and users. A representative sampling of user opinions is crucial to gathering an accurate reading on user needs and requirements. The first two phases, assessment followed by planning, are perhaps the two most important phases: without undertaking rigorous and thorough assessment and planning stages, the subsequent three phases will not realize their potential. The assessment serves two important needs: it documents the needs and requirements of the user population, for the purpose of answering those needs. Before undertaking any site or portal design or redesign, regardless of the size of the project, a requirements assessment is necessary to identify, develop, prioritize, and document goals and current practices. 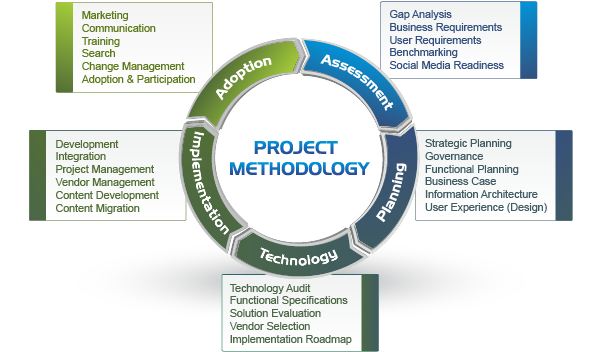 As mentioned above, each engagement begins with an assessment that concretely identifies and documents the project’s goals and objectives, aligns those objectives with those of the sponsoring department and the enterprise as a whole, as well as documents the needs and requirements of the user audience and stakeholders. Armed with the acquired data and knowledge, a detailed strategic blueprint – including creative, information architecture, and plans – can be crafted to build a leading edge site. Individual modules in the Assessment Phase may include Stakeholder Engagement, User Research Review, User Survey, User Focus Groups, Benchmarking (sometimes conducted in the Planning Phase) and the delivery of the Key Findings Report. While the assessment phase identifies and documents requirements of stakeholders and users, benchmarking and best practice research documents the practices and success stories of competitors and leading companies. User and stakeholder input is critical to a site’s future success, but it is also invaluable to learn from the success stories and best practices of other organizations that are leading the way. Together, the combined knowledge from both stakeholder/user requirements and the best practices of competitors and leading companies can provide a powerful amalgam of insight that is ideally suited to drive a highly valued site plan and design. At the conclusion of the Benchmarking module, Prescient will produce three to four page reports on each company and incorporate those best practices into specific recommendations of the final blueprint as well as include each benchmark as stand-alone case studies. Once the needs and requirements are identified, the planning – or the response to the expressed needs – may begin. This stage is unquestionably essential to the site’s future success as it provides the strategic direction for building, governing/managing and measuring the site/portal after the launch. The strategic plan provides the high-level direction including the mission and vision of the planned intranet or portal. It also determines the goals and the critical success indicators or benchmarks for success. The end result of this stage, for inclusion in the final blueprint, will be a defined vision and mission, and definitive goals. Included in this stage will be one to two half-day workshops to develop the vision and mission statements as well as critical success indicators for measuring the future success of the site. Prior to these sessions, each stakeholder participant will be expected to complete a short questionnaire regarding their requirements and vision of the site/portal. A common, unified look-and-feel and content experience is vital for improving the user’s experience. Information architecture involves the design of organization, labeling, navigation, and indexing systems to support both browsing and searching. It plays a central role in determining if users can easily find the information they need. Many of today's intranets and portals lack the effective foundation of an intuitive information architecture. Despite attractive graphic designs and a solid technological base, these sites fail to provide intuitive access to the site's content. The process of information architecture design begins with research into mission, vision, content, and audience during the assessment phase. This initial strategy consulting provides a foundation for the development of a successful information architecture design that supports long-term growth and management. A well-designed information architecture minimizes the time that users spend looking for information. Finally, if properly planned, an initial investment in a scalable architecture (one that can adapt easily as the site grows) will prevent costly redesigns in the future. To learn how Prescient can turn your intranet or website into an award-winner, please contact us directly.